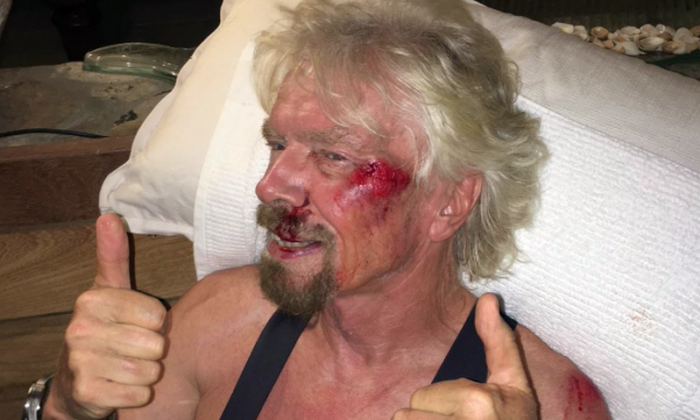 Richard Branson, the Virgin Group CEO, said he’s happy to be in the land of the living after a bike crash that left him bloody and bruised. Branson, in a post on his website, said he was biking down a hill when his bike hit a speed bump, tossing him into the air. He was cycling on the British Virgin Islands. The 66-year-old business magnate also posted a photo of his bloodied face. Branson, who is worth $5.1 billion, suffered torn ligaments and a cracked cheek. “My bike went flying off the cliff and disappeared. We’ve since recovered the crumpled bicycle, completely destroyed. My cheek has been badly damaged and my knee, chin, shoulder and body severely cut,” he wrote. Branson said he was amazed he was alive. Branson said he still wants to complete the Virgin Strive Challenge in September. “My attitude has always been, if you fall flat on your face, at least you’re moving forward. All you have to do is get back up and try again. At least I’m practicing what I preach—though a little too literally!” he wrote. Branson has a well-documented knack for adventure. He crossed the Atlantic Ocean in a hot air balloon in 1987, and in 2004, he set a record for the fastest crossing of the English Channel in an amphibious vehicle.